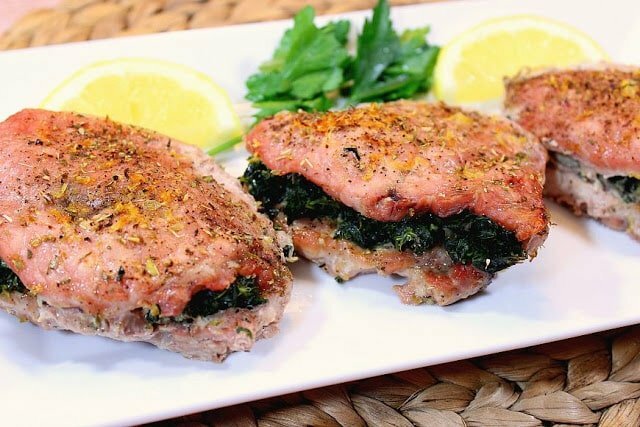 If you love Greek flavors, then you’ll love this easy to make five-ingredient recipe for Greek Spinach with Feta Stuffed Pork Chops. The hardest thing about this recipe (and it really isn’t difficult, you’ll just need a sharp knife, and I’ll walk you through the process), is butterflying the boneless pork chops. 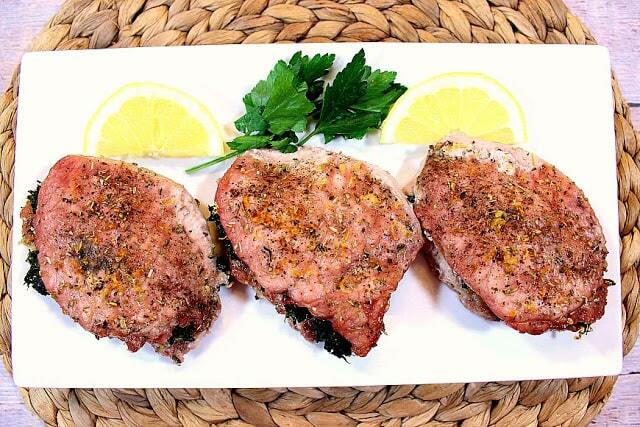 After that, it’s a breeze to get these delicious pork chops on the dinner table in no time flat. The key to easily butterfly boneless pork chops is to use a very sharp knife. Since I’m always working by myself in the kitchen, it’s hard to take the proper pictures with only two hands. However, I’ll try and explain it the best I can if you’re new to the technique (see photos below the recipe). Place one hand flat on top of the pork chop. By doing this, you can easily feel the thickness of the chop making it easier to guide the knife through the center of the chop. Use a very sharp chef’s knife, and slowly and carefully slice into the center of the chop holding the knife horizontal to the chop itself. The hand on top of the chop will help guide you with even slicing. As you slice further into the pork chop, you can start to open the chop like you do the pages of a book. Continue slicing carefully through the center. Once you’re almost to the edge of the chop (do not cut all the way through), stop slicing and open the chop all the way. You now have half the thickness, and twice the volume of the chop, and plenty of surface area to place your filling. Viola! You’ve done it! *Note – You can butterfly all kinds of protein this way. Boneless chicken breast comes to mind first and foremost, but this also works for beef cuts as well as veal. Once butterflied, you can also pound the meat with a mallet or rolling pin if you need a thin, piece of meat for scallopini, or even schnitzel. If you pound the meat between two pieces of plastic wrap, this will prevent the meat from tearing or ripping as you pound. 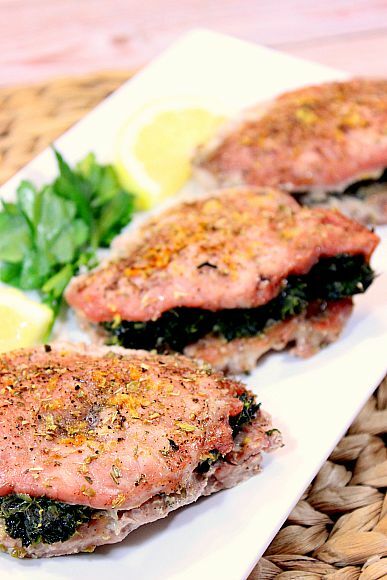 -Sprinkle the opened butterflied pork chops with salt and pepper. Divide the feta cheese and half of the lemon zest evenly among the 4 chops. Top the feta and lemon zest with the divided spinach and sprinkle with ½ teaspoon oregano. Close the pork chop by folding the plain meat over the filling. Top each chop with an additional bit of salt and pepper, the remaining lemon zest and the remaining oregano. 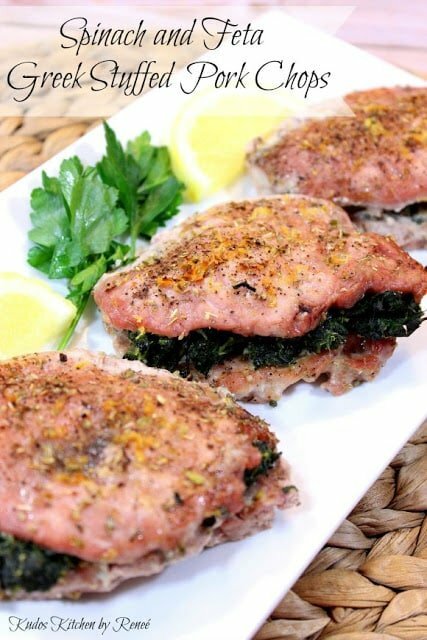 -Bake the chops in a preheated oven for 20-25 minutes. If you’re a regular follower of my blog, then you know that I also have a passion for painting as well as cooking and baking. 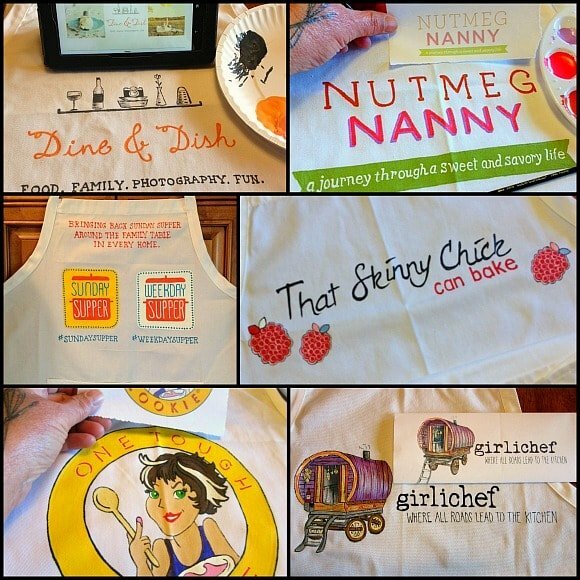 As luck would have it, my passions have collided, and I’m now painting aprons for food bloggers as well as everyday home cooks and bakers. I adore every single moment I get to spend in my Kudos Kitchen, and I’m thrilled to be able to share my passions with you! Perfect instructions for butterflying the pork chops! Greek flavors are always popular at my house and I know my family would love these. This is going to be dinner on Wednesday night! thanks for sharing. I love Greek-inspired dishes and this one is no exception! I've never stuffed any kind of pork before! It's time to change that. The filling here sounds great! I love the step by step instructions to doing this pork! It looks really delicious. And these aprons are amazing! You did such a great job! Some serious yum happening here! I spy Gail and she looks fabulous! I love the spinach and feta flavors here! Also, I've always very much admired your painting! So, this involves pork and knife skills — my hubs will be ALL OVER this recipe haha! It looks absolutely delicious!! I think I might have to order me one of these aprons for my blog – they look absolutely amazing! You are so creative! I am loving the Greek inspired flavors here! Especially all that spinach! This looks amazing! Thank you for showing how to butterfly a pork chop. Not everyone knows how to do it. And you did it beautifully!